A while back I posted that I needed some gardening book recommendations and I thought I would share with you one of the books I settled on. I really appreciated all of the comments and suggestions I received. I was specifically looking for help in the area of vegetable gardening. I needed a resource guide. I know in many families, information is passed on by the elder generations. Unfortunately, after my grandmother past away when I was 12, my family resource and connection to gardening was gone. 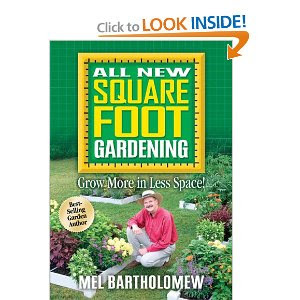 I purchased 'All New Square Foot Gardening' by Mel Bartholomew to assist with my veggie gardening questions. I am a beginner veggie gardener and really needed some help with the basics. I had already made the decision to abandon my attempts to garden directly in the ground this year and had built raised beds. Mel's book spends a lot of time selling his gardening idea of using raised beds and then sectioning them off by the square foot. Many of the early chapters are redundant, however, the overall theme of gardening in less space and using the space you have more effectively was of interest. I also liked the encouragement to utilize climbing supports in raised beds and with what plants to do this with. The best part of the book was at the end. In the appendix there are plant descriptions, charts, germination charts and outdoor sowing guides. Ah! This is what I needed. The purchase of the book was worth it for the valuable information at the end. I realized that I could have started some plants earlier in late winter/early spring and I realized that some of the seeds I had sown indoors were not going to transfer well. Bugger. This book is good for a beginning gardener and someone relatively unfamiliar with vegetable gardening in general. Again, many of the early chapters are elementary and a bit redundant. However, the appendix, charts and guides were exactly what I needed to develop a better understanding of when to plant and what to start indoors. It is possible that someone who had only been taught to grow a garden in the fashion of a 'mini farm' could be interested in this book as there is much discussion on why those methods are not effective for garden to kitchen nor do most people have a lot of space to garden in our modern area. Later this year I'll post another book review that Tatyana over at MySecretGarden recommended. I love Mel's book - it makes vegetable gardening seem so simple. I probably wouldn't have ever started a vegetable garden without the confidence his book gave me. Also, check out Gardener's Supply's website. They have a kitchen garden planner (plan your own) that is another great reference in how many seeds to plant per square foot. What a good idea to review this book, Jenni! I bought a book today too. A Reader's Digest flower book - I'll let you know how it it. Hi Jenny! I got some good ideas from this book too, but haven't become a square foot gardener. I hope the next book you mentioned will be 'A Garden Gallery' by Little and Lewis. It looks like a great read and resource for veggie gardening. Good luck with your garden, Jenni. I have this book too and love it. I haven't so far ventured into the world of square foot gardening but I'm certainly tempted, having read the book. My favorite gardening books are an old copy of The Readers Digst Illustrated Guide to Gardening. That bugger covers everything. I also love Sharon Lovejoy's Trowel & Error. Problem is I can do all of the reading in the world and all of the planning in the world, but in the end I just threw it all to the wind and plunked those little seeds where ever it looked right. Should be an interesting veggie year:) Good luck with yours. I like that we are both starting together. I have a feeling you will be more successful. I think it's sounds like a really good book. The part you mention at the end is probably what I need. We just started lettuce for the third time and covered all the seeds with bird netting this time. I'm determined to have lettuce this year. Catherine, I lost part of my first lettuce sowing to either birds or slugs or both. I put up netting too, and some slug bait (worry free kind as we have pets) and have now had some success!